Simply connect your Twitter account and start scheduling all your visual marketing content from one Later account. Post limits: Free plans have 50 Twitter posts per month while paid plans have unlimited Twitter posts. Sign into Later on the web and click the Group Selector in the bottom left corner. Select the Group you'd like to add Twitter to. If you have multiple groups, make sure to select the group you would like to add your Twitter account to. Click the + symbol at the top of the Calendar and follow the prompts to connect your Twitter account. 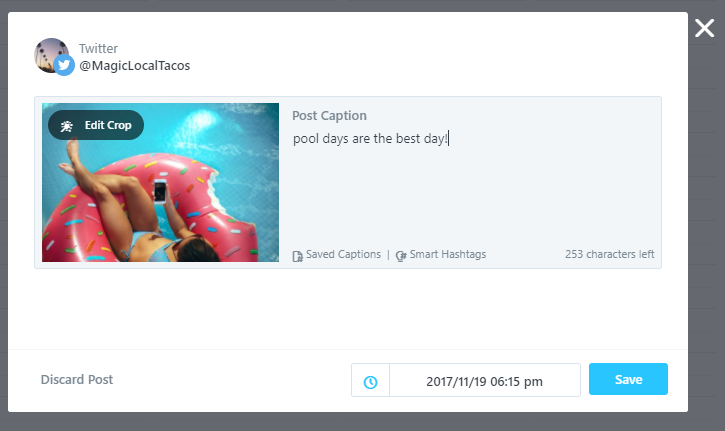 You can schedule a tweet the same way you schedule for Instagram, simply drag and drop an image or video from your side library to your calendar to schedule a tweet! A reminder that Twitter posts scheduled using Later must contain a photo or video. On our paid plans, you can schedule a multi-photo tweet with Later! Just select multiple images from your side library before dragging into your calendar. You may attach up to 4 photos, 1 GIF, or 1 video in a Tweet. Twitter's new character limit is 280 including an image! Click Save to schedule your post! And you’re done! Remember, Twitter allows autoposting - so sit back as we post for you.